The island of Adonara in the East Nusa Tenggara province is one of the Lesser Sunda Islands, squeezed between Flores, Lembata and Solor. With an area of less than 500 km2 and a population of about 100,000 inhabitants it is one of the smaller islands of Indonesia. 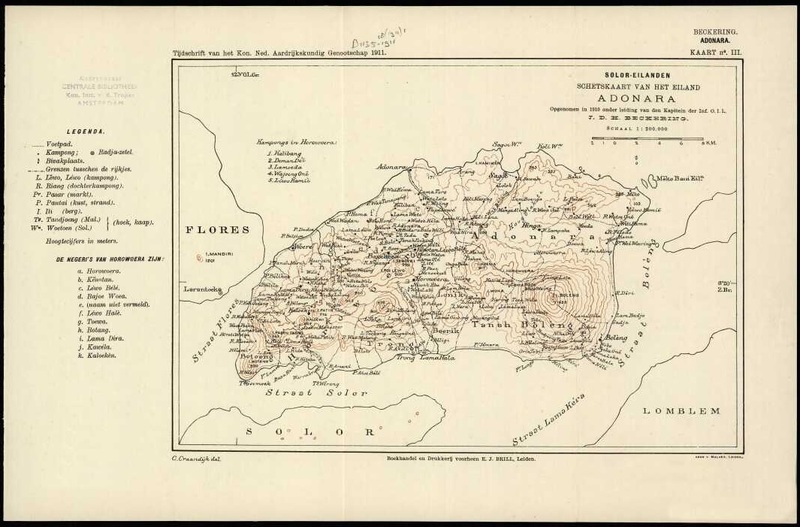 Due to its remoteness it took until 1911 before the Dutch published a printed map of the island. 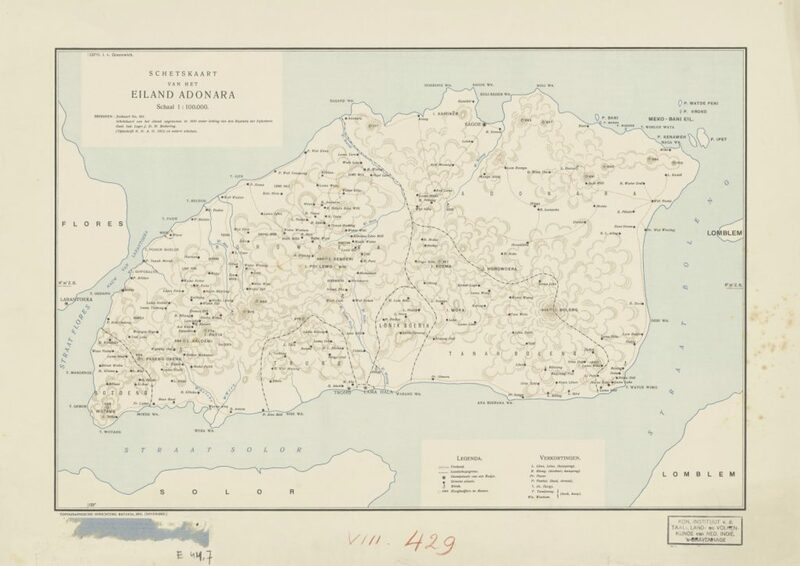 In November 1911 the Topographische Inrichting (Topographical Service) of the Dutch East Indies in Batavia published a sketch map of the island (Schetskaart van het Eiland Adonara), on a scale of 1:100,000. 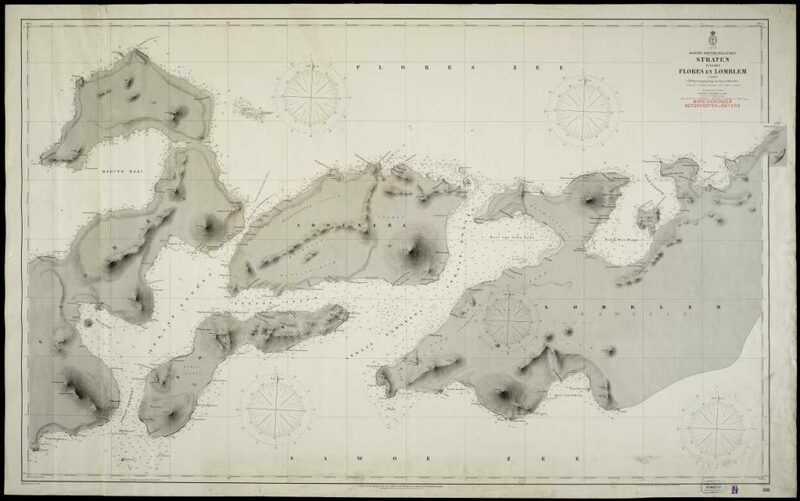 On the printed sheet the sources were listed with which the map was compiled: a hydrographic chart, a map of the island published in the journal of the Royal Dutch Geographical Society and ‘other sketches’. The map of the Topographische Inrichting, November 1911 (UBL, KITLV D E 44,7). The sketch map in the journal of the Royal Dutch Geographical Society (KNAG: Koninklijk Nederlands Aardrijkskundig Genootschap) was published earlier in the same year of 1911, but on a smaller scale of 1:200,000. The map titled Solor-Eilanden: Schetskaart van het Eiland Adonara by J.D.H. Beckering. The map belongs to an article by Beckering that described the islands of Adonara and Lembata. Both printed maps show strong resemblance, especially in the outline of the island’s coasts (based on the hydrographic chart), the borders of the various ‘landscapes’ or ‘principalities’ (‘rijkjes’ in Dutch), footpaths and river courses (for which supposedly the Topographische Inrichting used the KNAG-map as source). The depiction of the elevation of the terrain is very different. On the KNAG-map the heights are indicated with contours and on the map of the Topographische Inrichting the heights are mapped surprisingly less accurate with a more indicative use of symbols. The map in the KNAG journal, 1911 (UBL, KIT, KK 165-04-04). The hydrographic chart, 1911 (UBL, KIT, KK 021-05-10). 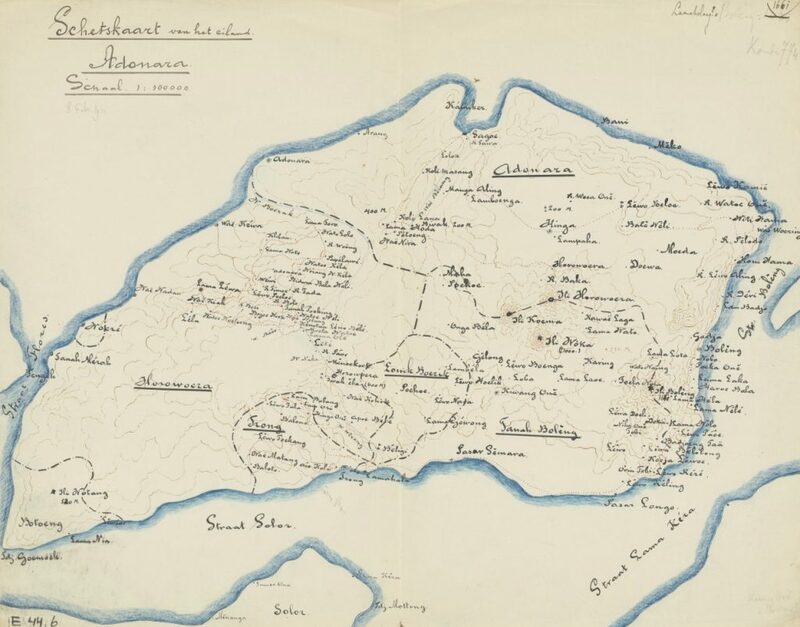 However, in the KITLV-collection two manuscript sketch maps of the island are kept, one dated 8 February 1910, the other undated but in all probability from the same year. Could these two hand-drawn maps be the “other sketch maps”, used as source for the map published by the Topographische Inrichting? Two answer this question we have to look to Gerret Pieter Rouffaer (1860-1928), explorer and collector and map cataloguer for KITLV, in that time a colonial institute in The Hague. In the first months of 1910 he joined the expedition of the Topographische Inrichting, led by Major P.J. Spruijt, to survey the smaller islands near Timor, including Adonara. In the same months, Captain Beckering led a military expedition to Adonara and Lembata in order to disarm and register the local population. For eight days Rouffaer stood under Beckering’s convoy on the island of Adonara (and later for another eight days on Lembata). It was Rouffaer, who had been editorial secretary of the KNAG journal from 1906 to 1908, who asked Beckering to write a description of the two islands for that journal. By the way, the mapmaker of the KNAG journal, Coenraad Craandijk, was appointed by Rouffaer in 1906. The dated manuscript map, 8 February 1910 (UBL, KITLV, D E 44,6). Both manuscript maps are not in the handwriting of Rouffaer, apart from the pencil dating. Nevertheless, they both have to be related to the expeditions to the island in February 1910. When we compare the dated manuscript sketch map with the printed maps, it is clear that this sketch is less accurate. Especially the outline of the island is inaccurate, but for example also the location of the Ile Boleng volcano. The manuscript map has also contours for heights but these do not match with the KNAG-map or the other manuscript map. 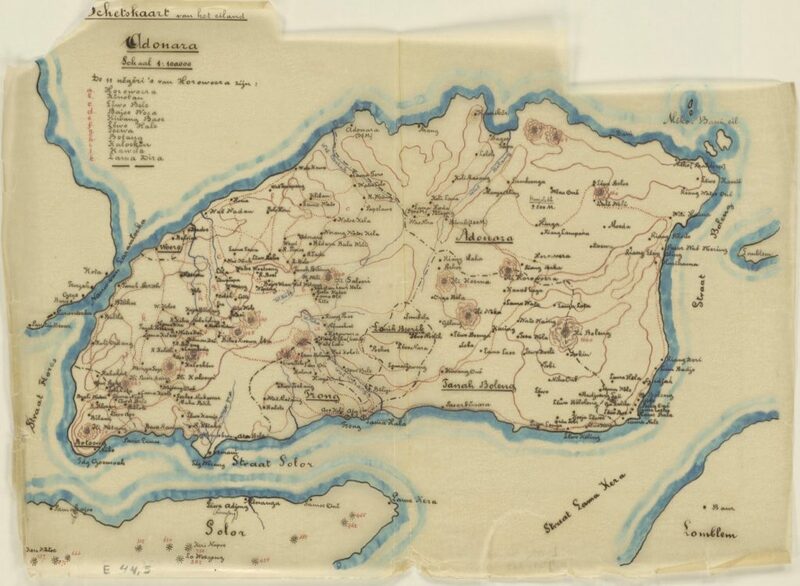 The dated manuscript map probably drawn a little earlier than the other manuscript map, since the place names in the southwestern part of the island are missing. The undated manuscript map,  (UBL, KITLV, 44,5). The undated manuscript map, drawn on tracing paper, is more accurate. The coastline is probably derived from the hydrographic chart. Again, the contours for heights show a different pattern. The borders of the ‘landscapes’ are more or less comparable on both manuscript maps, but differ from the pattern on the printed maps, especially in the southern districts of Trong, Lama Hala and Lonik Boerik. With only a few exceptions, all place names on this map match the names of the two printed maps. Therefore, it can be assumed that the manuscript maps could have served as a source for these place names in particular. J.D.H. Beckering, ‘Beschrijving der eilanden Adonara en Lomblem, behoorende tot den Solor-groep.Tijdschrift van het Koninklijk Nederlandsch Aardrijkskundig Genootschap, Tweede Serie 28 (1911), pp. 167-202. Paul van den Brink, Dienstbare kaarten. Een cartografische geschiedenis van het Koninklijk Nederlands Aardrijkskundig Genootschap en het Tijdschrift 1873-1966. Houten, 2010. Frank Okker, Rouffaer. De laatste indische ontdekkingsreiziger. Amsterdam, 2015. Dit bericht werd geplaatst in Blogpost door mapsinthecrowd . Bookmark de permalink .